I’ll bet you’ve never seen a caravan quite like this one. We took a car, a rental truck, two vans, and a bus hauling a trailer (yes, you read that right!) to Fort Collins, CO. Then we added another van & trailer on the trip back! 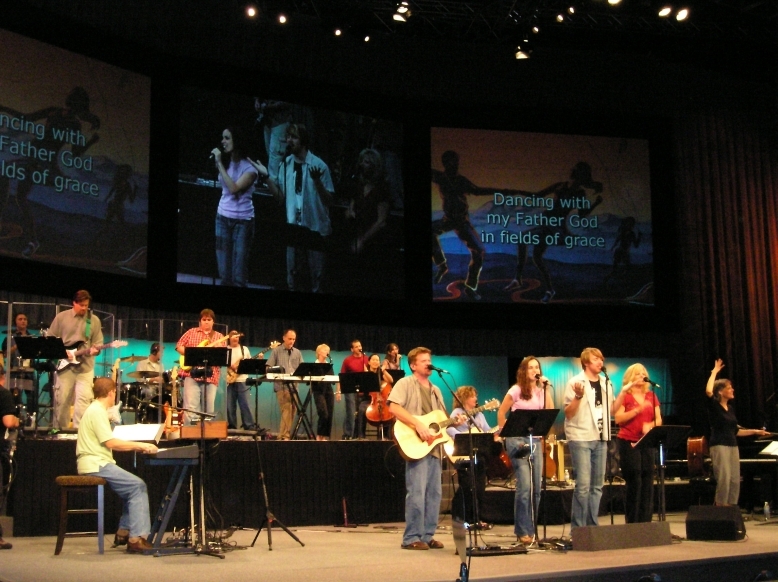 Keynote provided the conference worship music (pictured below), showcased our evangelistic bands, and had a booth with promotional materials at the conference Ministry Fair. When you add all these things together it means we have to haul a lot of STUFF out to CO and back — hence all the vehicles!! Call me crazy, but I actually enjoyed the two-day trip out and back! I rode on the bus, where I read, chatted with coworkers I don’t often spend time with, and even used a ministry laptop (the bus has something called a power inverter that runs several electrical outlets.) There are even two VCRs, some built-in bunk beds (which I didn’t use) and a not-so-great-but-helpful-in-an-emergency bathroom in the back!